When is a Blue not a Blue? 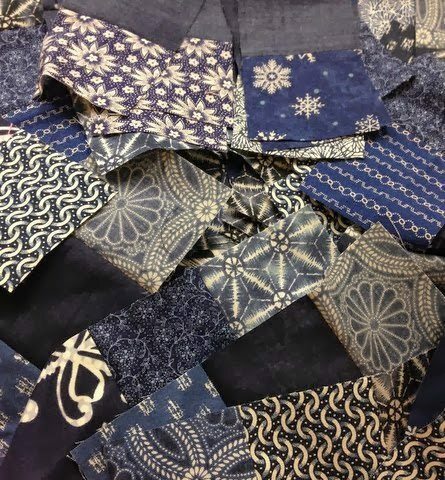 I am making a Blue and White quilt for a magazine and I challenged myself to only make it from blues in my stash. Well it seems, I have predominately these types of blues – aqua/turquoise and navy/indigo blue in my collection. For this quilt I will be using the dark blues and a piece of light denim blue. What blue is the dominant shade in your stash? Jacaranda blue, sky blue, aqua, turquoise, indigo, navy, bright blue, teal or denim? Lots of turquoise blue on my shelves. Your blue quilt will be gorgeous in that dark shade. I like these blues! I struggled choosing my blues as every blue seemed to be either a bit towards green or lighter (like aqua) than the blue I was imagining would work. In the end I chose solids and still struggled! Blue is my favourite colour so I have quite a range but at the moment I'm making a hand stitched quilt using colours similar to yours contrasted with a lovely buttery yellow! That means I've used most of those fabrics. Probably the most would be in the turquoise range I think! I don't sew much with blue, but when I do it's usually in turquoise or denim blue. I love your little pile of blues! I tend to gravitate to indigos (for traditional piecing) and aquas (for modern piecing). My stash is the same way! I have a LOT of aquas, and a bunch of navy. But recently I needed a few hues of true blue and I only had 2 light blues and one royal blue. And it isn't like I don't like those regular ole' shades of blue, I do! Do you think maybe that recent fabric lines just haven't trended that way? Definitely aqua, and I've been trying to rectify that and get more cobalts and navys recently. I seem to have collected a lot of turquoise blue this year. I went through a big phase of buying blues, and like you I seem to have aqua blues or navy blues. and lots of denim 🙂 Your collection of blues is lovely, you'll have fun sewing with those.